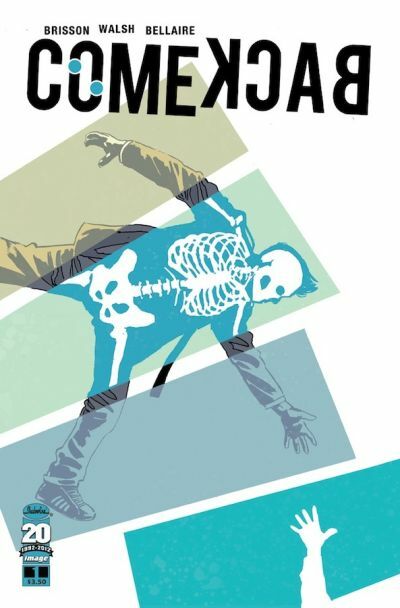 In the world of COMEBACK by Ed Brisson and Michael Walsh, the new mini-series coming from Image Comics/Shadowline in November, death isn’t necessarily inescapable. The secret organization Reconnect sends agents back in time to rescue people moments before their untimely deaths, reversing tragedy and reuniting lost loved ones with their families. Mark is one of these agents, and despite the seeming good of what he’s doing, he discovers there is a dark side to saving the dead. In COMEBACK’s science fictional world, the role of wealth plays an ever-increasingly important role. Mark sees the problems this inequality creates first-hand as his partner, Seth becomes obsessed with his own mortality and begins using Reconnect’s time-travel capabilities for financial gain. When Seth’s activities risk exposing Reconnect, agents like himself and Mark find themselves in danger of being exposed along with it. COMEBACK is a full-color, five-issue monthly mini-series debuting on November 21. Writer Brisson is best known for his work as a comics letterer and his online comic Murder Book, on which he has collaborated with several artists, including COMEBACK artist Walsh.